Why you should vote GOP, and why there realy is a difference between the parties. Over time I've given a lot of thought to what makes our country great, and what we can do to ensure it stays that way. I don't claim to be an expert in politics, just a thinking American. My hope really isn't to get you to vote for a certain party as much as I hope to get people THINKING. I believe to many vote their emotions, and make themselves easy to manipulate by politicians. I like to teach by example, and I intend to use as many examples as possible here. If you would like to send me your reasons, or example why you vote the way you do please email alvin_ka9qlq@yahoo.com I'll consider it for posting. Why think before you vote? Emotions are a wonderful thing, but not for making decisions. Politicians know that when they can evoke emotion they wont need to explain or justify their true positions as much. Statements like, "My opponent is a dog whipping, pollution loving bum that if elected would starve kids, and evict the elderly." aren't meant to inform, their only porpoise is to frighten. I dare any one to find someone that wants our water and air dirty in any political party. How we keep our air, land, and water clean is what we need to be asking our leaders, and candidates. That requires a plan though, and that requires more effort than some want to put out. Also you need to know if that office is even connected to a given issue, and if not why is the candidate wasting time talking about it? Example any one who runs for dog catcher will say they're for clean water, and education, but will they catch dogs, and try to reduce strays? If so what is their plan? If they can't answer that why are they running? The GOP is for the rich lie. Let me propose a tax to you. One that has no brackets, no deductions, and is caped at say $76,000 income so the rich wont be hassled by it. You say that's unfair, and you'd never support it? You already pay it, and it was started by a Democrat by the name of Franklin D. Roosevelt. It's Called F.I.C.A. You pay a flat 7.65 % on every dollar you make, no deductions. Your employer matches the amount making the tax total 15.3 % of your income. The tax is capped at $76,000, meaning if you make a million dollars you'll pay the same ($11,628) that you would pay if you made $76,000. Let's look at it another way, $11,628 to a million is a tax rate of 1.1628%. Now let's look at some other tax Proposals. When Ronald Regan became president in 1981 he cut EVERYBODY'S taxes 25 %, and in 1986 he took a lot of the working poor OFF the tax role by raising the personal deduction. Look it up. "In 1980, the top 1 percent of taxpayers (about 1 million individuals and families) paid about 19 percent of the federal income taxes; in 1998, the top 1 percent paid 35 percent. Meanwhile, millions of low-income Americans pay little or no federal income tax, or receive a share of more than $30 billion in tax credits for the working poor." Now let's look at the poor in the same news story. "The picture changes somewhat when payroll taxes for Social Security and Medicare are included. About 80 percent of American workers pay more in payroll taxes than they do in income taxes, according to the CBO. The bottom 40 percent of the taxpaying population, who contribute about 1 percent of income tax revenue, pay about 14 percent of overall payroll taxes. The top 1 percent pay only 4 percent of all payroll taxes." That's because F.I.C.A taxes are capped and the rich don't pay them. Are we realy killing the planet? Here's the truth! I got these charts off The Learning Channel. 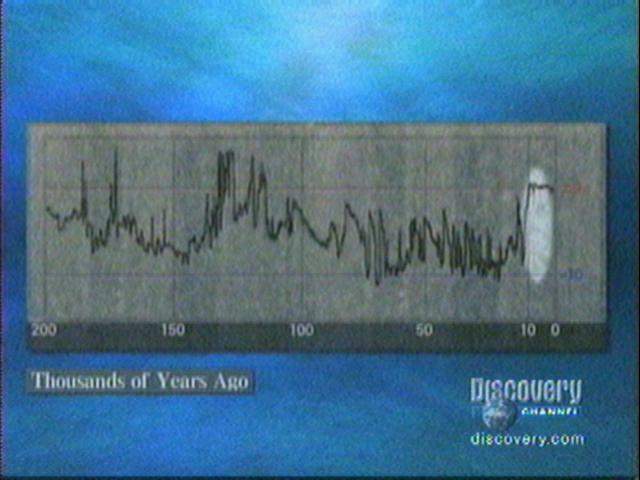 They show the average temperature over the last 100,000 and 200,000 years. The data was obtained from core samples drilled into the ice pack. As you can see the average temperature has varied by a wide margin several times over the past 200,000 years until about 10,000 years ago, then the climate suddently quiets down. 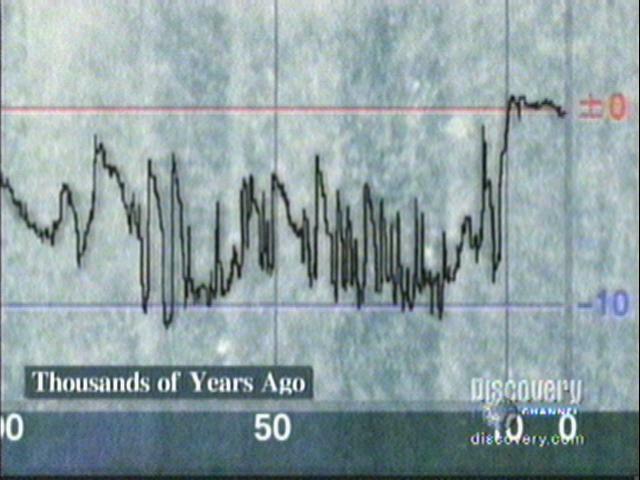 The line has been almost flat over the last 10,000 years. The very same 10,000 years the environmentest claim we've been systematicly trashing our home. Now as I've said no one wants to live with dirty air and warter, but if we're poluting the planet where's the spike in the chart? An Annanova news story stated Boing aircraft Co. wants to design a new tipe of plane specificly to fairy ozone up to high altitudes to fill the hole on the ozone that environmentalest blame man for making. The reaction from environmentalest? "Oh no, we can't do that, we don't know what would happen because no ones ever done that before!" They know what will happen, they'll loose their soap box and source of scaring funding out of people to push their real agenda. Controle of your life. They also know there realy isn't enough data to know if this isn't natural. Remember nature cycles, some times by wide margins. At present we are experiencing the highest number of sunspots sense the 1950's (sunspots are what makes ozon in our atmosphere). The number of sunspots cycle over an 11 year peek to peek time period (some say the entire cycle is much longer.) Over the past 50 years while the sunspots have been low you would expect a decline in the ozone! How big government destroys culture. Absent Fathers Dependent Children was started to help mothers who had lost a husband, or just had the father run out on them. Most people would want to help a struggling single parent make ends meet, but look what it's become. I personally know of a woman that told me she refused child support from her boyfriend. Why? Because she lives in a government subsidized apartment that charges $25.00 a month to live there because she's a single parent. If she took child support her rent would go up. That's YOUR money raising a kid you didn't make. A lot of people have ageing and disabled relatives they can't care for on there own. Medicare and Medicaid will pay for them to stay in a nursing home to take the burden (and responsibilities) off families, but consider this. All businesses try to make the one they get money from (usually the customer) happy, but in a nursing home the customers (residents and families) are not the ones paying. It's the government. In a nursing home if you don't get your shower or have to wait a half an hour to be put on the toilet, you can't just tell them "I'm not paying for things I didn't get". You have to file complaints then they have to be investigated and nursing homes have the right to appeal findings. Even in bad ones it's a long drawn out process while the nursing home continues to get paid. Most people wear out and give up, trusting a business that has no interest in listening to you, watched by a government that has no interest listening to you. "Throughout his eight years in office, President Clinton warned us that the next great menace was international terrorism. . . . He also brought unprecedented prosperity to our nation, and because of that, President [Bush] can use the surplus Mr. Clinton left behind to pay for many of the nation's needs in this time of crisis. . . . This lecture series is about the human spirit. To me and millions of others, President Clinton has always personified that. He is the man from Hope, and that is what he has given us, hope. We miss him. Thank you, Mr. President." - Helen Thomas, former UPI White House reporter.